I am an ornament collector. My mom gave me one every year growing up and I do the same for my kids. I also get an ornament from every place we visit. Or if Jarom goes somewhere cool without me, his souvenir for me is always something to hang on my Christmas tree. I absolutely love to pull out the ornament box and go through all the stories that belong to each and every ornament hanging on my tree. Here are a few of my favorites from the "grown up tree" (not Cousin It tree) that I wanted to be sure to have pictures of in case an unfortunate event were ever to occur to any of them. Be sure to click on each collage to get a close up view; they're so fun to look at if I do say so myself. My pineapple from Hawaii, seahorse (he's jointed and bends all over) from our trip to the Oregon Coast (we went to the Newport Aquarium), Chinese Santa Jarom brought me from China (check out his cute little slanted eyes), and the one you can't see very well is our pickle that we hide in the tree each year (a fun little tradition handed down from Jarom's mom). My blue Delft Santa from Holland (probably my most expensive ornament on the tree, I have to hang him up high), a paper mache ball Jarom brought from India, the Merlion bell from Singapore (India and Singapore were our most difficult Christmas ornament finds) and tucked deep in the back of the tree, a polished coconut from Costa Rica. 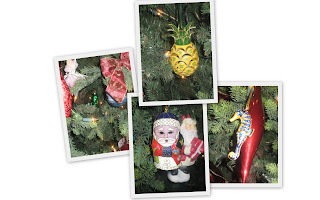 These are a few of my favorite homemade ornaments. The little soldier and lady my mom made for my very first Christmas. They are made out of popsicle sticks and if you pull on a little string their arms and legs come out like a jumping jack. I really think I need to make a set of these for each of my own kids. And also, my little baby sleeping in a walnut shell that my mom also made. And notice the cute little paperclip skate in front from Little Momma. I am very sentimental about my ornaments. I absolutely cherish each and everyone and the memories behind them. 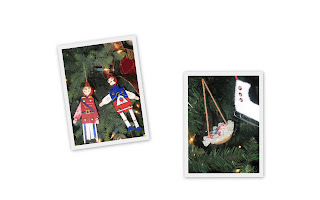 Do you collect ornaments or anything sentimental? Have any favorites? i love them all! what a great tradition. i wish i could get my act together to do something like that. That's great! If it weren't for my step-mother, my tree would be pretty bare! She gives each of us an ornament every year. It's fun to do that for your kids too! What a great mommy you are...those are definitely priceless! i'm the same with my ornaments....perhaps the whole ornament a year thing is a mormon tradition (perhaps not...) i've got one from every year growing up as well and now my mom does it with all the grandkids (and us too...) which was nice when we were first married b/c we actually HAD ornaments to put on the tree...i'm actually more partial to the family tree (as we call it) rather than a themed tree...and since we only have room (and money) for one tree; the fmaily tree it is! What a great idea. I collect magnets to go on the fridge from all the places that we go. And I just read that I can get my computer fixed, but so they make house calls to Utah. My computer is so old and needs some serious upgrades. You do the pickle too?! Sometime while in college mom found those ornaments and decided to buy one for everyone. We let Lily "hide" the pickle on our tree, but she gets to "find" it on my parent's tree since we are down there for Christmas. My favorite ornament would have to be one called RolyPoly Circus Clown. He was part of a set my mom got from Avon. He is just one big fat Circus Clown! I loved him as a child because he spin like a top if you twisted the string he hangs on. Oh and I LOVE your polished coconut. VERY pretty! They are beautiful. And no, sadly, I'm not really into my ornaments. I have a few, favorite, handmade ones from my childhood, but that's about it. Quite frankly my tree is pretty bare. I am buying one each year for my kids though.....I've got to do that this weekend. So glad you enjoy them all. That makes it fun! Wow! I bet your tree is just beautiful! Isn't it amazing how it doesn't matter how many ornaments are on your tree, you can remember where every single one came from and who? I love it! We had the same tradition growing up and have implemented it in our family. It's really cool to reflect on the history of the ornaments. Brent and I also started collecting navivity sets. We have some really cool foreign ones. I had planned on doing the one ornament a year thing, too, in our family -- and then DH's mom sailed in with sending the Sweet Girl like 25 ornaments in a package *a year*. This went on until we asked her to stop. (we did that verrrry nicely, don't worry!) They are all beautiful and varied, but have no memories behind them. I am grateful, but also a little disappointed that we didn't do your ornament tradition. Oh well. I have seen those Christmas pickles. I just didn't get it. So...are you supposed to hide it? We have tons of Hallmark ornaments. Some of them are so pretty. And some of them...they just remind me of my childhood. I love the ornaments that we got for my dad. Now...I just wish we could put up the tree. And not have to worry about the kitties destroying it. How Wonderful! Since Tanner started to like to watch his hands slowly crush ornaments, Stevie Gave me the idea to hang a garland on the wall with my 'nice' ornaments...it's worked quite well, actually, and considering our tree has been pulled over about 8 or 9 times, this $2 garland has served its purpose well! I LOVE your collections!!! I really want to come and see your tree...without Tanner! 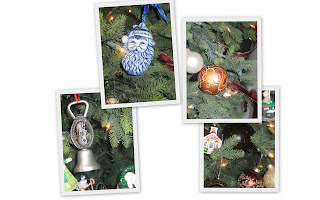 I love that you took pictures and shared a little history of your ornaments. 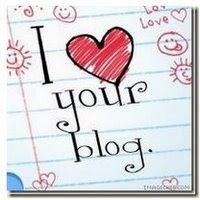 See how great the blog is for family history!! I love it. We just started a new tradition last year. A good friend game me 3 wallet sized picture frame ornaments with the year 2007 on them. This way I can track my cute kids each year and have THEM on the tree too. Fun! I have a few that I cherish. Sadly BECAUSE I cherish them, they don't get hung! I take them out of the box every year, look at them, remember what they meant....and then pack them back up again! Maybe in a few more years! I have always loved looking at your Christmas tree though. It does have the coolest ornaments ever! Those are great! Love the painted Popsicle stick people! I don't really collect anything. I love several of my ornaments, though. But I don't have very many cool ones. My mother-in-law gave my kids an ornament every year and said she would til they were 18. Then she stopped for some reason when Mac was about 4 years old. I'm guessing she forgot that she was doing it! lol!